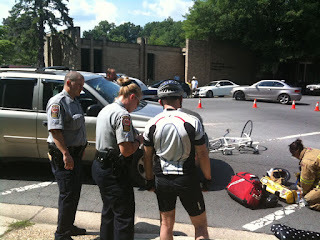 Fairfax County Police released the final stats on bike crashes in the county in 2011. The good news is that there were no bicycle fatalities last year. You may recall there were four in 2010. There were 84 crashes reported to the police, down 2 from last year. There were probably three times that many crashes that went unreported. In 51% of the crashes, the bicyclist was held at fault. Fairfax County had an estimated 10,612 total crashes in 2011. Crashes involving bicycles in this same period represent less than 1% of this total. [emphasis by police]. I guess we're supposed to feel good about this small percentage. The statistics can be found on the county 2011 Bike Crash page. Try to ignore the photo of the goofy looking bike and the very poorly produced safety video on the page. Huh? "The good news is that there were bicycle fatalities last year." Oops. Thanks for catching that typo. I've changed the post. "The good news was that there were NO bicycle fatalities last year."